My F9.. 10k on the clock ..front right brake calliper has an issue. The middle of the three pistons (ABS) is jammed . I was advised to yank it out, swap the seals and put it back all without messing with the fluid, just keeping the calliper in an upright position . It all went to plan but the piston is still not moving..
All the parts look in good order and the old seals looked perfect to my eyes..
Are you trying to squeeze the piston out using the brake lever and hydraulic pressure? Did you thoroughly clean out where the seals sit? The pistons 'stick' due to a build up of dirt/corrosion behind the seal. If you've only swapped the seals for new, then the new seals will still grip the pistons too tightly due to the dirt/corrosion behind them. Another method/tool I've used to clean the recess, is a hex precision screw driver melted through a piece of perspex. Sharp and hard but not harder than the alloy, so no danger of damaging it. Works well... score a corner of perspex and snap it off. That is some thing to try. I've had to deal with a few frozen brake pistons in the past - I had a Kawasaki ZX7R and the six pot Tokicos were a f*cking nightmare - I ended up ditching them and fitting some Bandit 12 Nissin calipers because the Toks freezed up so often - but enough about me! back to your problem! Compressed air - I actually managed to blow out a stuck piston once with a foot pump - but a proper garage type air compressor will be more effective - just make sure you stick a rag or something around the caliper to stop the piston going into orbit when it pops out. Dedicated slide hammer type piston removal tool: I have one of these kits and they work well - but can fail to budge VERY frozen pistons - if you plan on working on your motorcycle brakes in the future then it might be worth investing in one of these - I found this set on Ebay for 30 quid - a few years back you couldn't get one of these kits for under 70 quid - so it's a bargain - check that one of the 12 adaptors will fit your pistons if you buy it - sizes range from 19 to 30mm - the reviews for this kit are very good. The grease gun is an old trick - a lever action grease gun puts out 10,000psi,more than you will get any other way...not with air,not with an air powered grease gun either.Just a bit messy that's all. 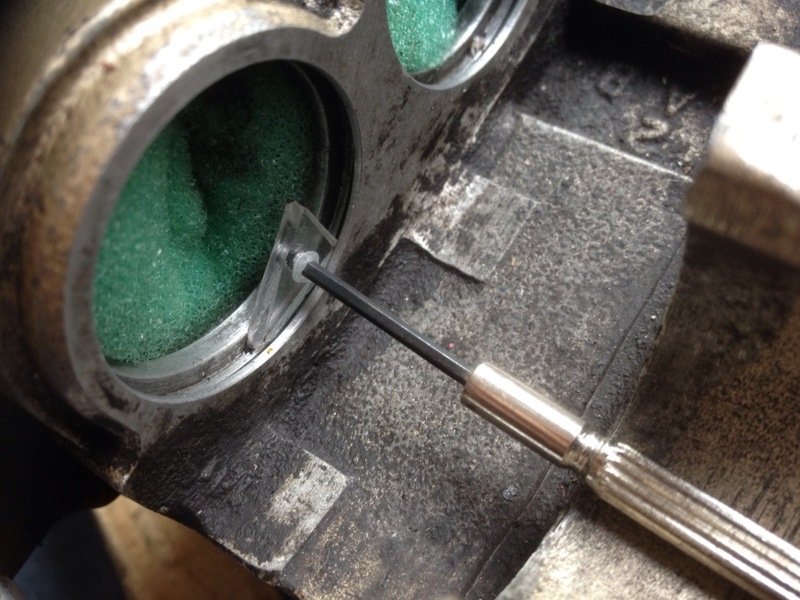 I know that you want to remove this piston as quickly and easily as possible, but from experience sometimes you just have to knuckle down and accept the fact that it's going to take removing the caliper and using one of the above methods to get that sucker out. Hey Hoon.... i think he managed to remove the piston and change the seals. ... i don't think he cleaned out any corrosion or dirt build up. Thanks for the effort Hoon. Today I went to the garage because my back brake pedal was pressing down way low.. I had gotten air in the system.. The mechanic discovered that the piston was now working properly , he bled it and we are all good now ..
Crumbs! Never knew that. I've never had an ABS equipped bike so have never had to deal with that extra level of complexity.